Congratulations to Brother Tom Marchozzi '05 for edging out Brother Jay Brunetto '05 in the 2013 championship of the Phi Sig Fantasy Football league and taking home the coveted Bear Trophy (named in honor of the late house advisor, Robert "Bear" Kohler). The SmashBrothers squeezed out the win with just two points over the Allen Street Arborists to give Tom his third championship since the league formed in the Cloud Room at the fraternity house back in 2004. Other members include Brothers Chris Loftus '04, Sean-Michael Yonson '04, Phil Korenman, Derrick Magee '04, Jason Phillips '05, Dave Phillips '06, Ward Williams '05, Mike Cavanaugh '05, Kevin Flynn '06 and Travis Craig '04. Tom Marchozzi '05 wins the 2013 Bear Trophy. After completing my Undergraduate degree at Penn State in 2005, where I was a member of Mu Alpha Theta and Phi Sigma Kappa, I began working at Ernst & Young. After 5 years of Public Accounting experience, I left to start my own Accounting & Business Consulting Firm. My company, Douglas Leech & Company, LLC, has been open for a year, and my Corporate Headquarters is in downtown Pittsburgh Pennsylvania in the U.S. Steel Tower. I have two branch offices; one in Wexford Pennsylvania, and one in Morgantown West Virginia. I currently serve local clients, clients all across the United States and multiple International Clients, in all industries and of all sizes. I am a member of the AICPA, PICPA, Financial Accounting Foundation (FAF), and Blue Ribbon Panel of the FAF. I am a member of the PICPA's "Emerging CPAs" Committee/Task Force, and the "Relations with Schools and Colleges" Committee/Task Force, as well as a Panelist for the PICPAs Annual CPE Conference. I am very involved in charitable organizations in the Greater Pittsburgh Area, as a member of the United Way, Big Brothers Big Sisters, and the Food Bank; and lead Capital Campaigns for all of these organizations. 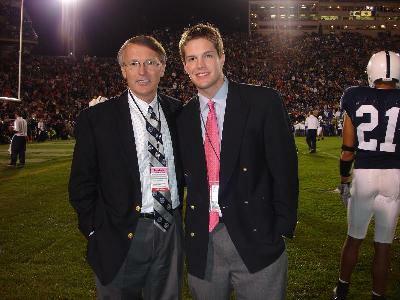 Picture of me and my dad at the PSU vs. OSU game in 2005. Just Married in September of 09. Living and working in Manhattan. Working in D&O Insurance Underwriting. My wife Alison gave birth to our daughter Olivia on December 19, 2006. Everyone is doing well. Life has defintely changed in a matter of moments. I look forward to seeing you guys soon. Give me a call. As for Kunkle if you get this I work in Rockville and for Conley maybe I will try and make it to the gathering in DC. We'll see how the baby thing is going. Take care everyone. It has been a busy fall for me. I got married on October 2, 2004, and had just bought a house a week earlier. Things are starting to settle down a bit. I look forward to seeing the brothers again soon. I am attending graduate school in Chicago for forensic psychology. All are welcome to visit. I got the Kappa News today and it reminded me to update. Well let's see, I am still in Marietta, GA attending Life University. I have about a quarter left to go, thats about three months, I don't no they're into the quarter system down here. After that I am thinking about going west, they say it's best. I like the Colorado area or maybe Europe, defiantly somewhere between the two.It really depends on what my wife and I can agree on. I did get married about a year ago and I have a little girl who is almost six months. I have seen a few people from Penn State but no Phi Sig's so if any one is in the Atlanta area let me know and I'll see if I'm allowed out. Just bought a place in West Chester, where I live with my girlfriend, Melissa. Pretty busy working and taking MBA classes in the evening. Feel free to email me if anyone is in the Philly area. Attending grad school in Chicago for forensic psychology; all welcome to visit. I am teaching English in Kanazawa, Japan. Would love to hear from folks so send me an email. I didn't even know this website existed until today...Sorry Conley...anyway quick update: I work for American Airlines at the Tulsa, Oklahoma Maintenence and Engineering Base. Best Job I've ever had....where are the rest of the Pintos? 2 quick notes for the Ewoks 1) if you get married do me favor and give me heads up (if you dont want me to come just send me an email with your address and either Ill send you cash or a breadmaker Ill let you pick) 2) if you run a marathon no one cares seriously.Heres my rundown. Ive been in Charlotte for 4 years now. I count beans for a living at Siemens. Good times. I live a couple of blocks from the Carolina Panthers stadium and heres the kicker Im not sure if anyone is aware of this yet, but the secret in Charlotte is slowly leaking out NASCAR is taking over the world and Charlotte is at the epicenter! (I think just I threw up in my mouth just writing that line) Anyway, if anyone is ever in town, shoot me an email. Ill show you we getherr dun in the South. Here is a quick update of everything that is going on. I moved to Baltimiore 2.5 years ago. I got married last August to Nikki. We are in the process of buying our first house in the city, should close mid-July. And I just ran my first marathon last weekend (June 5) with Team in Training in San Diego. My wife and I raised over $8000 for the Leukemia and Lymphoma Society during our training. I have been living in Connecticut for 10 years, married a local girl, and became a commercial real estate/land use attorney working in Greenwich. I rarely see the light of day but the work is interesting. Apparently, all PSU Phi Sigs move south immediately upon graduation. Anyone coming up north? My wife, Marie, and I were married in 1998 (17 Phi Sigs attended). We have two children. Michael John is 3 1/2 and Emilee Grace is 3 months. I still make it back to a couple of football games a season, usually with Brian Pierce, Mark Zahorchak, Todd Polechko and Mark Riley. The news about Bear's death was a shock. Many of his fellow teachers, students and over 40 Phi Sig alumni returned. He would have been proud to hear all the great stories that were shared. I met Jeff McGraw, Andy Kirschler, Bob Bashaw, Riley and Polechko for martinis at The Tavern in honor of Bear. About 20 other alumni were there. Bear was correct, three martinis is too many ...... especially when you follow them with two Original Sins and a couple of pitchers of beer. I am hoping to make it down for the Blue White Game with my family. If anyone else is interested, give me a call. Live (in the city) Boston, work in Biotech, ski in Vermont, hike in New Hampshire, beach in Southern New Jersey, miss all my friends. Keep in touch if you ever want to catch a baseball game at Fenway and see one of the great historic American Parks with the awe of the towering Green Monster in the outfield... and if anyone wants to stop by and party like Rock Star look me up, definitely not ready for marriage yet. I said Chowda... Chowdaaa!!! Haven't been to the website in a while... what's the matter with all of you with these wedding announcements?!?!?!? I graduated law school out here a year and a half ago and believe it or not, am working as a Prosecutor for the city of San Diego. Just moved in with my girlfriend, Ashley, in a nice apartment downtown San Diego. Got a couple of dogs who love running on the beach. We have a spare bedroom in case anyone is out on the West Coast. Bridgett is now 7! Life is awesome! Damn proud! Gavin Michael Polechko born March 4, 2002. Joins sisters Halle (4) and Kate (2). This is this first confirmed male birth in my pledge class, although there are rumors that Pedro has sired several children across Western Europe in the mid 90s. My wife, Lynette, gave birth to our baby girl... Annalise Bickley was born on April 5, 2001. Our family sends good wishes to all Phi Sigs and their families for 2002. On February 3, 2003, Aria Marcia Tirion was born in San Francisco. Big sister Eva (2 1/2 yrs.) is very proud, and Amy and I are doing great. If ever in San Francisco, please give me a shout. My wife, Suzanne, gave birth to our son, Ryan Joseph, on December 31, 2002 (just in time for that tax credit!). We wish everyone a Happy and Healthy New Year! Busy year for me. I got married to Raegan McClain (a Kappa Delta from PSU) this past Labor Day. We bought a house in Chicago during the summer. I thought it interesting that from my class there were FIVE marriages between Phi Sigs and Kappa Deltas (mine being one of them). So pay attention when deciding who to ask for Superstars -- it may be more important than you think. Damn proud! Married Amy J. Davis on October 13, 2001. Scott Pirrello and Mike Zaherchak, both class of '98, were in the wedding party. Several other Siggers attended. Married Lilian Esparra on 7/20/02. Going to law school in San Diego, CA. 2001 was a busy year for the Lehrichs. We moved to Summit, N.J., in January. Both Ellen and I started new jobs--she as marketing manager at Pharmacia Corp. and I as senior healthcare equity analyst at SunTrust Robinson Humphrey. In November, we welcomed our first child, Samuel Alec, to the world. Regards to all. Amy and I are enjoying parenthood. Our daughter, Eva (2-1/2 years old) will gain a brother or sister in February, making us a family of four.I am still managing global accounts with Latitude Communications, a voice and web conferencing provider in San Francisco. Please look me up if you are ever in town. Been married for 5 years and have a 3 year old daughter, Sadie. Been employed in the child support field for 12 years. 11 years as a Director. I own my own commercial cleaning business. My wife, Marla, and I got married in 1996 and have three children (2 boys and 1 girl). I love living in Georgia. Brothers, give me a call, especially if yall ever get to the Atlanta area. Married to my wife, Suzanne (PSU 96) and we have one son, Ryan (1). Currently I am working as the Director of Technology Restaurant Division for EatnPark Hospitality Group, Inc. in Homestead, Pa.
After several years in Boston, I've returned to Pittsburgh. Much has happened since my last return to Penn State, and I'm looking to reconnect with my brothers. If you are ever in the area - call. 781.929.7410. On May 18th Kelly and I had our second, Patrick and Caroline is now a proud older sister. I've been promoted to Eastern Regional Sales Manager for Lambent Technologies out of Chicago but we still live in DC. Kelly is Director of Marketing for Choice Hotels. Please call if you find yourself in the DC area. I was married November 30, 2002, in Echuca, Australia, to Rebecca, the Australian I met while studying abroad in Melbourne during Spring '96. Brothers Bill Marcolini and Jon Grammes were in the wedding party, and Brothers Jeremy Frank, Josh Peters, Joel Miller and Joe Wachs made the trip to attend the wedding. I have been living in Denver, Colo., since Jan. 2000 and am now working at a three-person boutique investment banking firm that specializes in advising banks and mortgage companies. Brothers Jason Miller (Denver) and Jason White (Fort Collins) are also living in Colorado, and we see each other frequently. Damn Proud! Been a while but... Took a year between Phi Sig and Pitt Med School to travel. Australia and Japan. Worked for a few months in the FDA as an ""investigator"" (agent 918) an in a pharmaceutical co. Pitt Med for 4 years. Married Gina (the girl I met in Australia junior year). Moved to NYC and did a 6 year neurosurgery residency in the Bronx and Manhattan (saw a lot of crazy stuff during those years). Had a baby girl Sophia my last year of residency. Moved to a small beach town in Northwest Florida (Fort Walton Beach/Destin) to start private practice. Had a second baby girl Samantha 5 months ago. Working hard, loving life, missing State College and Phi Sig a lot lately. Hoping to get back for a few days in the fall. Still keep in touch with Goof Peterson and once in a while M.T. Hed. I am a moron when it comes to Facebook but maybe I can learn something new. Have been in the WBS area since 1994 and call it home. I am finding little in the way of job opportunities but am paying my bills. I was one of the millions who sold their house SHORT last year and am thankful to be out from under that burden. I work in the Lowes DC in Pittston and enjoy the physical work to keep me from getting too flabby. I golf once or twice a year and would like to come to the golf weekend in Harrisburg. Please make it the 21st so I do not get my second divorce. My daughter is now 23 and works in Manheim Township SD as a Spanish teacher. She makes more money than me and pays her own bills. I am thankful for that. See you guys in May. Dave Lawrence class of 81. New position, Physician Clinical Director of the Emergency Department and Trauma Medical Director at Monongalia General Hospital in Morgantown, WV. Married 14 years to Cheryl Mason Lawrence, 13 year old daughter, Morgan. All is well albeit busier than h***!!! I am married to a wonderful woman names Devon, and we have a 16-year-old daughter, Shea. I run the Bridgestone/Firestone store in Mechanicsburg, Penn. I try to play golf once a week and enjoy deep sea fishing and hunting. In August of 2007 I made a big move quit my job moved my family to Virginia Beach VA and partnered with my brother in a chemical lawn care company. My daughter transferred from Alvernia College in Reading PA to Old Dominion University in Norfolk VA. If any one is in the area please look me up. I am working in Harrisburg. I am helping to build an electronic field reporing tool. This tool will allow the Troopers on the road to use the in-car computers to record their investigations. It has been very rewarding because paperwork is the bane of all good cops everywhere. Going up for Illionis and Michigan.......Who else?? I have been working in the Staffing and Human Resource Services business since 1991 in Pittsburgh, PA. Owning my own recruiting firm for five years until I sold my company to The Callos Companies. Today, our combined company provides Direct-Hire Recruiting and Search, Temporary Staffing, Employee Leasing, Outplacement and Executive Coaching. If you are looking for a new job opportunity or are looking to hire someone, or just looking to network, send me an email. I just got a promotion to the "NFL" of my industry. I am a regional sales manager for Telsmith Crushing and Screening Co. Still living in Northeast Pa. with my wife Sandra, Son Devin 14 and Daughter Alexandra 10. I'm always on the road. Give me a call and I'll buy lunch. I am Tim's Brother. Thought that some of the people that knew Tim should know that he passed away 1-25-02 after a long fight with cancer. I have two sons, Samuel (3-1/2) and Benjamin born February 25, 2003. My wife, Becky, and I are the proud parents of Briana, almost 4, and Ryan, who just turned 1 (January '02). After six years and six re-organizations, I finally got downsized from my corporate job in the booze business. I have now started my own business in the pet waste clean-up industry. Check us out at www.scoopadapoopa.com. Business stinks, but its picking up. I took more crap in my corporate career than Ill ever take with this business. My family, Betsy, Tucker (13) and Brooks (11) are loving life in Texas. Continuing the TK world tour - Just finished a relocation to London - Will be spending about a year here (likely to go back to the 'burgh after), working as a consultant at BP. Drop a line, & stop by if in the UK (or planning to be)Damn Proud! 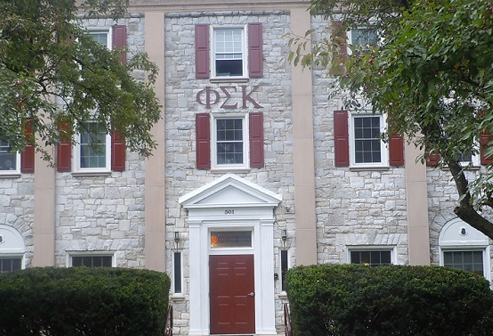 Hello Kappa chapter! Hard to believe I've been here in St. Louis for over 17 years! It's nice to read what's beengoing on with everyone. Carol and I have been married almost 18 years now, and we have three boys: Ryan (17), Kyle (14), and Nolan (11). My free time is spent keeping busy with the three of them. I coach baseball and football, and I am active in scouting. I still love to fish, although I haven't done any hunting since I moved down here. I also get the occasional round of golf in.I heard from Scruffy via e-mail a while back. He discovered I worked for Boeing, and he works right across the street from Boeing in Seattle. If anyone is ever in the St. Louis area, give me a call and maybe we can get together. I am currently enjoying life in Las Vegas with my wife Jane and son Jack, who turned one on Dec. 8, 2005. I work for Scottish & Newcastle Importers Co., overseeing sales of Newcastle Brown Ale in the southern Nevada market. Sales are robust and I am doing what I do best- selling and drinking beer ;-)One of the great benefits of living here is that I am fortunate to hear from brothers passing through town for conventions or vacationing. In the past year I have enjoyed visits with Tyler ""Tippy"" Morehead, Mark ""Zot"" Kozak and Jon ""Caesar"" Hillis. If anyone is heading to Vegas, please get in touch, it is always great to see old friends from the House. We even have a guest house available if you need a place to stay, we call it the Russ Hilton. As always, the beers are on me. Cheers! I am married to wife Lisa for 7 years and have two girls; Anna, 5 and Abby, 3. I am partner in audit practice of Schneider Downs, a regional CPA firm with offices in Pgh and Columbus. I see Mcgraw, Kirschler and Jim Risbon in Pgh. I am deploying to Southwest Asia as part of Operation Iraqi Freedom 3. I am an executive officer of combat support helicopter battalion. I work for Schreider Downs & Co., a regional CPA firm in Pittsburgh, as an audit senior manager. I'm living and working in the DC area as an independent computer network consultant. I'm currently in my 7th year of self-employment.The former Kathy Weber and I have been married for 15 years now and we have two children (Joseph, 7 and Caroline, 2). I still play Utimate Frisbee a couple of times a week and I occasionally run into Dingle, Esserman, Hillis, Shrooms and Zilla. I've been living in Hermosa Beach, California, for the past nine years and have been with AT&T for all of that time. Currently I am a sales director in Los Angeles and welcome any visitors. My wife, Karen, and I have a two year old boy Sam,. Live outside New Hope, Pennsylvania. I'm an OB/GYN physician in Lawrenceville, New Jersey, and Yardley, Pennsylvania. Elaine, the kids (Anna, Eddie, Maria, Maggie) and I have moved to Strasbourg, France. We are enjoying the European culture and cuisine. It is a lot of fun to see all of the history in Europe. We will be here for 2 more years and welcome you to visit with us. Just give us a call. I hope all is well with everyone up north. Wow, 20-year reunion for the quarter brains. You guys are old! I cant believe its been 17 years since I migrated to South Florida. I have been married for 13 years to my beautiful wife, Jackie, and we have two boys, Jake (8) and Cameron (4). Except for hurricanes and the ability to cast a ballot, life is good in sunny Florida! If you remember the game, I hope you're still playing.We have introduced ""99"" to our friends and neighbors in Texas and it is slowly, but surely, displacing poker as our regular ""card"" game. Everybody loves the spontaneity of it, the silly ""rules"", and of course the occasional nice cold swills of frothy ale. So, if you're conducting business in Texas any day soon and you see someone pointing at a pie-chart or sales forecast with his (or her) elbow, you'll know where he/she was the night before. Damn proud to be a Phi Sig from Kappa.Much to the chagrin of ""99"" purists, I WAS forced to attempt to reduce the rules of ""99"" to paper format to enlighten fledgling neophytes as to proper procedures, protocol, and hosting requirements of a typical ""99"" game. If you would like a copy of these rules so that you may,in turn, enlighten your own neighbors, just shoot me an e-mail and I'll be happy to forward on to you. Lives in Allentown area with wife and two daughters, ages 6 and 9. I have become a soccer dad. Living in Washington again. I hit a bump in the road and had to move back east but I've been back in the Seattle area again for four years. I have two boys. The oldest, Jimmy, is nine and lives in Pennsylvania with his mom. Patrick is four and lives with my second wife, Christine, and I in Issaquah. We are thirty minutes from Seattle and the Puget Sound. More importantly, we are forty minutes from the mountains and some awesome snowboarding. If anybody is ever in the area drop me a line and I can show you around the most beautiful area in the US. Wife, Karen and I have a two year old son, Sam. We live in New Hope, PA.
Jeannine and Tim are the proud parents of Aidan Patrick born July 1, 2004. Tim is the president of Midwest Financial. The family resides in Pittsford, NY. Well, I heard a reunion was held and I missed it. Typical Quarterbrain!I am living in Westchester County, NY, north from Manhattan about 30 min. by car ride. I married a fellow Penn Stater in 1991. Her name is Penny. She's the best. We have two great children: Eric is six and Sarra is nine.I am looking forward to the next get together. I can be reached in my NYC office at (212) 418-2670.Peace, ... out.